Happy Thursday!! 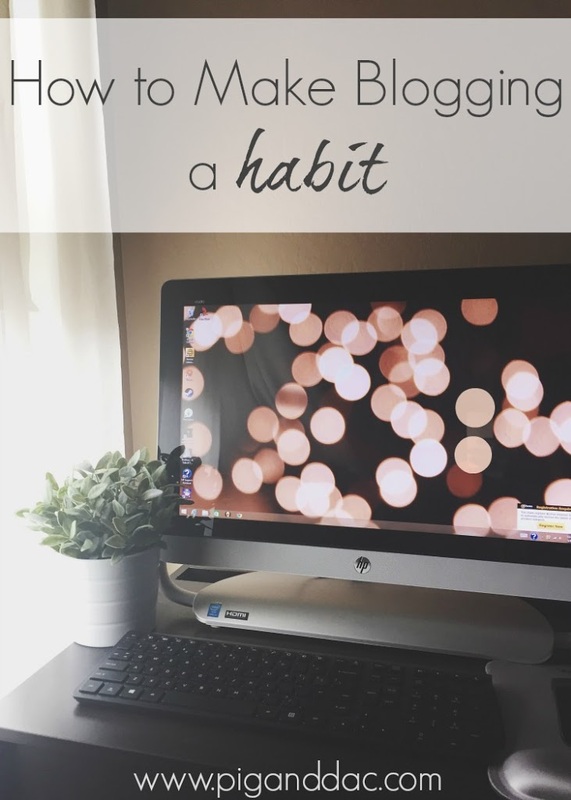 Since I know so many of us have fresh plans for the New Year with our blogs, I wanted to share a helpful post today with some tips on making blogging a habit. Statistically, and statistically in the blogging world is always changing because the blog world is always changing, the average blog lasts only six months! And the average “bigger blog” is 33 months old. What does this tell us? It means a few things. It means that blogging, after the initial excitement phase is over, takes some discipline. And it also means that for the majority of bloggers, success comes from hanging in there and not giving up. How can we get past the first six months? After it’s not “new” anymore and quite frankly feels like a chore at times? I am no blogging expert, but I’ve hung in there for awhile, so I’m going to share some of my tips with you. Read on! 1. Write down your blogging goals. Before you start or do anything else, (even if you’re already an established blogger, it’s good to do this every so often during the year), sit down and decide what you want to get out of blogging. Is it to have a creative outlet? To make money? To inspire others? To promote your business? Whatever it is, you need to put this down as your main vision so that you can remember why you’re blogging in the first place. You don’t want to just sail out there haphazardly with no direction; you’ll get lost quickly this way. Write it down and refer back to it often. 2. What do you want to blog about? This will be very helpful for not only yourself, but your readers as well to know what to expect from your blog. You don’t have to pick just one topic, but narrowing it down to a few will help you to not feel so overwhelmed when you’re trying to figure out what to write about. Ask yourself what you’re passionate about. What could you talk for hours about? I love to talk about motherhood, blogging, and personal development. So this year I will be focusing most of my posts around those three topics, with the random post here and there about other things if they come up and I want to share them. But it helps me to know what to focus on so my mind isn’t overwhelmed. 3. Make a huge list of ideas. Now that you know what you want to write about, get out a piece of paper and start writing down every topic of interest to you that comes up while brainstorming ideas for your niche. Questions to help you come up with ideas could be: what have you been experiencing in your own life recently that relates to your niche? What questions have you had that you’ve figured out? Once the ideas start to flow, you’ll probably come up with a whole lot more that you didn’t even think you had. One way I keep the inspiration juices flowing is to follow other blogs in my niche to inspire me. I get Scary Mommy and BlogHer’s daily newletters sent to my email and I subscribe to my favorite blogs. I made a huge list of ideas at the beginning of the new year by quickly going through the old archives of bigger sites like The Huffington Post in my niche, like the parenting or self-improvement sections, and just jotting down title ideas that were sparked by a post I saw on there. Don’t actually read the posts, just let the general topic spur your own imagination. 4. Make an editorial calendar. An editorial calendar is one of the biggest ways to avoid blogging lags and last minute posting panic. Once you have all of your ideas, schedule them onto a calendar. If you haven’t decided how many times you want to post, decide that now, and then fill in those days with a post topic. You don’t always have to follow your calendar if another idea comes up that you can’t wait to write about, but your calendar will always be there as your faithful backup. WordPress users have an editorial calendar plugin that I hear rocks, and Blogger users can use Google Calendar. I prefer to use the old-school way and write it out in my planner. Keep in mind holidays and special occasions while putting together your editorial calendar! I usually follow my editorial calendar and only change it up when I have a topic I want to write about right away. My calendar helps me to always have something to write about so I’m not left without any ideas. Some days you will not feel like writing. Some days you will not feel inspired. There will be weeks when you experience blogger burnout and question why you’re even blogging. Refer back to #1 when this happens. And just write. Even if you don’t feel like it. Don’t try to make it perfect, just start writing. Once you start, inspiration will usually begin to spark. 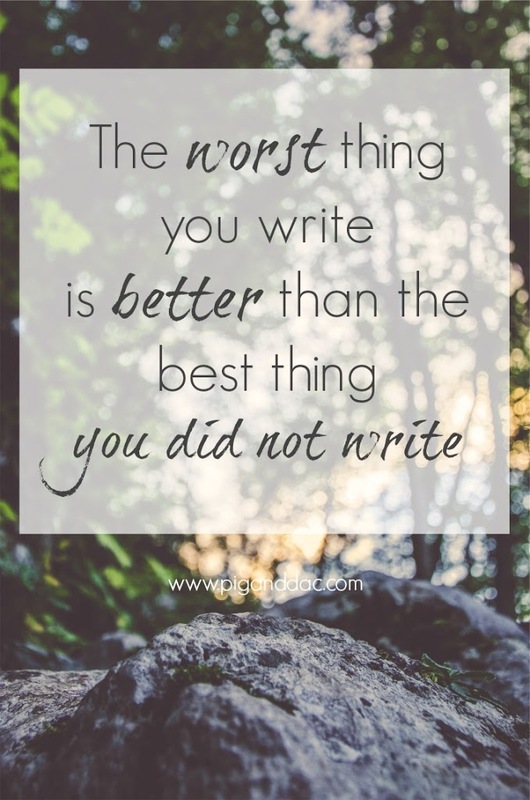 But you won’t get there unless you force yourself to just start the writing process. I’m not saying to sacrifice quality over quantity, I’m just saying the person who gets up and runs is doing better than the person who stays on the couch. It takes discipline for sure, but if you want to succeed at blogging, you have to push yourself through the writing lags that are bound to happen. Just do it! You will thank yourself later. Some of my best posts have come from the moments when the last thing I wanted to do was sit down and write, but once I challenged myself to just do it, inspiration kicked in and good things happened! Blogging isn’t a race, it’s a marathon. Like any other achievement, it takes discipline, practice, and passion. Keep yourself inspired, write it down, narrow it in, get organized, and just do it! I hope you found these tips helpful and I would love to hear what has worked for you in the comments below! I am so glad I found your site. I am definitely enjoying reading your posts but this specific post was really helpful to me as I am struggling to figure this out as a newbie to blogging. Thanks Lexi, I’m glad you did too! And I’m glad you found this post helpful! The editorial calendar is brilliant. I thought it might make the process feel more rigid, but it actually takes a lot of the pressure off. Knowing I have a specific topic I’m going to write about soon gets my subconscious working on it weeks in advance! The Google calendar is nice because you can drag and drop topics for posts. I don’t think I ever would have done this if not for your post, so thanks! Me too, I totally thought the same thing at first about the editorial calendar. But you’re right, it takes the pressure off and actually helps you feel MORE creative. I’m so happy you found the post helpful!